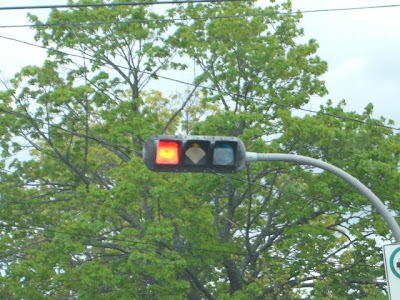 This signal in Hallifax, Nova Scotia, incorporated various shapes to its traffic signals. This enhancement provides additional information to all drivers, and particularly helps colorblind road users traveling through the intersection. It seems that a number of other countries have designed roadway elements and traffic control with colorblind users in mind. Unfortunately, consideration for colorblind drivers is rare in the United States.